The Camiguin Hawk Owl is a small owl with no ear-tufts. Distribution: Endemic to Camiguin Island in the Philippines. Original Description: Rasmussen, P.C., Allen, D.N.S., Collar, N.J., DeMeulemeester, B., Hutchinson, R.O., Jakosalem, P.G., Kennedy, R.S., Lambert, F.R. and Paguntalan, L.M. 2012. 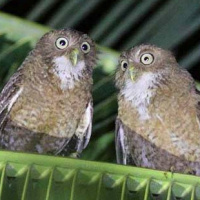 Vocal divergence and new species in the Philippine Hawk Owl Ninox philippensis complex. Forktail 28: p. 1-20.